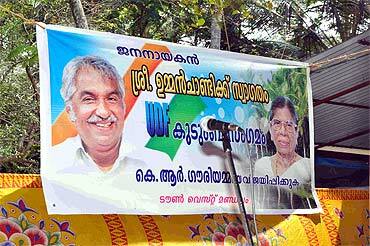 Rediff.com » News » Will Oommen Chandy be Kerala's next CM? Will Oommen Chandy be Kerala's next CM? As Kerala goes to the polls on April 13, the buzz is that the Congress-led United-Democratic Front has an edge over the Left Democratic Front in the state. 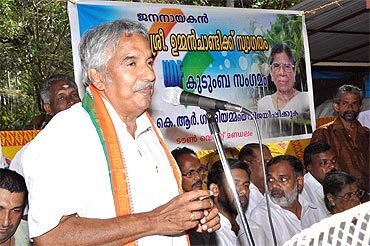 And there's all indication that Oommen Chandy could be the next chief minister. 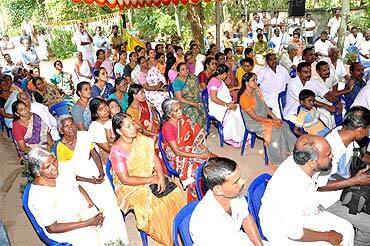 Chandy, who served as chief minister for two years after A K Antony resigned in August 2004, is a much-liked politician in the state. Despite attacks from the Left on his involvement in the palmolein oil import scam, Kerala's Aam Aadmi believes that Chandy is clean and this works to his advantage. 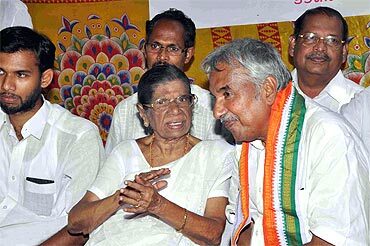 After campaigning in Alleppey for the legendary K R Gowri Amma, Chandy spoke to Rediff.com's Shobha Warrier about forming the next government in the state, development in Kerala, his prospects as the next chief minister and more. Most opinion polls conducted earlier were in favour of the UDF and that too by a good margin above the LDF. Ever since the arrest of former power minister Balakrishna Pillai in the Idamalayar corruption case, the margin has decreased. Are you worried? According to the second Asianet survey, we will win four to five seats more than the first one conducted by them. I don't believe in the other opinion polls because we are confident about our performance. So, what is there to worry? Will the 2G spectrum scam have an adverse impact on the UDF performance? No, on the contrary. The people of Kerala will appreciate the positive steps taken by the Centre against corruption. The UPA (United Progressive Alliance) government has ordered a CBI (Central Bureau of Investigation) inquiry into the spectrum case. And the proceedings will be monitored by the Supreme Court. The minister, against whom the allegations are made, is in jail. Nobody is protecting him and the people of Kerala are watching all of this. But has the government of Kerala taken such a strong stand against corruption? (Communist Party of India-Marxist state Secretary) Pinarayi Vijayan has been chargesheeted by the CBI for alleged irregularities in awarding the contracts to the Canadian firm SNC-Lavalin and the state government is trying to protect Vijayan. The state government is spending lakhs of rupees in supporting a corrupt leader. The government has appointed an advocate and he is supporting the arguments of Pinarayi, which is against the sanctions of the governor. So, it is quite evident that the Centre's stand on corruption is different from that of the state. Won't the arrest of Balakrishna Pillai, a partner of the UDF, have a negative impact on the party's image? Not at all. 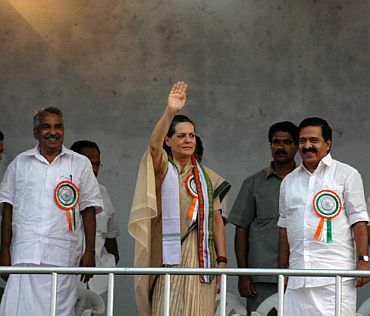 Pillai is the leader of one of our partners and we do admit that the Kerala Congress-B is our partner. But he was set free by the high court. Unfortunately, the Supreme Court verdict went against him. These are legal, not political, issues. You must remember that the first inquiry in the Idamalayar corruption case was ordered by the UDF government. So, we are sure that his arrest will not affect the UDF's image. As far as industrialisation goes, Kerala is far behind other southern states. If the UDF comes to power, what steps will you take to attract investment? Only the UDF can bring about development in the state. Our manifesto specifically talks about development and care for the poor. When the last UDF government was in power, the World Bank had conducted a study and the result showed that Kerala as the second most investment-friendly state in India after Karnataka. Kerala was then followed by Gujarat. Do you know at what position is Kerala right now? The 2009 study shows Kerala is placed 17th! The list had only 18 states. Do you know which state is at the 18th position? West Bengal. This is an indication that both the Left-led governments are at the bottom of the table. Why is it that industrialists are reluctant to come to Kerala? That is because the CPI-M has not taken any interest to bring in industries to the state. They are only interested in agitations and controversies; they don't care about the unemployment issues faced by the educated youth and the economic growth of the state. The last time when we were in power, the economic growth of that state was 11.7 per cent, and now it is below 8 per cent. Do you fear that the trade unions will obstruct your pro-industry policies? I don't fear or blame the trade unions now, as their attitude has changed. They understand the importance of globalisation and that today's norm is survival of the fittest. They have realised that if they don't change with the world, their life will be miserable. If they take a negative stand against industrialisation, it will only affect the future of the workers. They have realised the truth. I don't see much difficulty on dealing with the labour front. The trouble is with the Left. They have always taken a negative stand on industrialisation and are more interested in violent agitations to stall industrial growth of the state. When I spoke to state Finance Minister Dr Thomas Isaac he said the government is all for industrialisation. What have they done to attract investment to the state? I want to give you an example about the SEZs (Special Economic Zones). Every state is trying its best to establish more and more SEZs. The industries minister sent 17 proposals to the Kerala CM, but he blocked all of them. The proposals would be forwarded to the central minister only with the signature of the CM, but V S Achuthanandan did not forward a single application to the Centre. And it became a big issue within the CPI-M and the LDF. After that, they put 11 special conditions for Kerala if the SEZs had to be sanctioned and a government order was issued. Industries choose SEZs for certain privileges and facilities, and if you are going to block the facilities, who will want to come to Kerala? Now, it seems the CM feels bad about it. In the case of Smart City, they withdrew all the conditions they had put forth earlier. Whatever the finance minister tells you, this is the harsh reality of the attitude of the Left in Kerala. The reality now is that not a single SEZ is starting in Kerala. That is a very reasonable and valid question from the youth. Today, the youth are questioning the leadership. We have adequate resources, but we are not utilising any of them. We are not encouraging new investment in new areas. The youth have every right to question the leadership on why we are not giving them opportunities. The UDF has taken a positive stand and we are ready to adopt a transparent policy for the development of the state. We are ready for changes. We are ready for discussions if it is reasonable and we have decided to be strong in our stand. Earlier when the CPI-M opposed a decision, we were not very adamant. We tried to avoid controversies. We now want to say, enough is enough, and we are going ahead with our policies that are related to the development of the state. Do you feel the time has come for Kerala to go on a fast track? It is high time we act. If we don't act now, the youth of the state will come out and protest and if they do so it will be beyond our control. What are your plans for wealth creation in the state? We have not done anything to create wealth. We were always for the distribution of wealth. We have also taken loans and that too has gone beyond our control. But our manifesto now is that we have to create wealth and a portion of the wealth has to be given to the needy. We want to attract investment, build infrastructure and want to create job opportunities within the state. Am I talking to the next chief minister of Kerala? Nobody can say who the next chief minister will be. As per the Congress policy, we don't go to the elections projecting anyone as the CM. After the election, the MLAs will elect the leader with the approval of the high command. The MLAs and the high command will choose the leader. How confident are you about victory? We are quite confident because the people are in a mood for a change. We have won the Parliament and panchayat elections. We will continue the trend and win the assembly elections too. It will be a hat-trick for us.